A veneer, a thin slice of decorative wood, can be added to many of our flat or gently curved mouldings. We have a wide choice ranging from straight grain oak or bird's eye maple to the more tightly figured burr veneers. In this case elm burr veneer is being added to a plain pine moulding. A burr is a swelling on the trunk of a tree, thought to be the result of an injury, and providing attractively figured veneers with tightly clustered knots. Since they are not usually very big, a burr veneer is shorter than a regular veneer, and two or more pieces may be needed for one side of a frame. If they are cut from consecutive slices of the burr, they can be butted together so that the figure in one is reflected in the next. The veneer is first dampened and pressed overnight between two sheets of glass. It must be damp enough to be flexible yet not so damp that it rejects the glue. 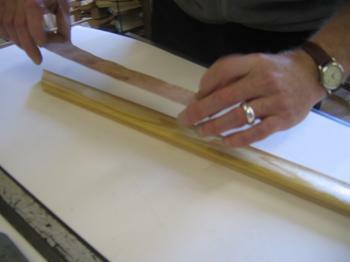 It is cut into strips just wider than the moulding. Both surfaces are brushed with contact adhesive and the strip of veneer is laid onto the moulding. When the piece is fully covered the veneer is rubbed with a steady pressure using an agate burnisher to remove any air pockets. The edges are then trimmed and the piece is sanded smooth with fine sandpaper and fine wire wool. The veneer can then be stained or left to reveal its integral colour, and finished by French polishing.